Eastern head coach Brian Bowen (right) talks with seniors Austin Coleman (center) and Ethen Richmond (left) during the Division IV Region 15 championship game on May 25 in Lancaster, Ohio. Gallia Academy sophomore Zach Loveday (10) hammers down a dunk over a pair of Rock Hill defenders during the second half of a Jan. 23 OVC boys basketball contest in Centenary, Ohio. GALLIPOLIS, Ohio — All good things come to an end. There were hundreds of notable athletic accomplishments over the course of the 2017-18 school year, but the last 10 months of competition ultimately resulted in something fairly uncommon in the Ohio Valley Publishing area. For the first time in at least 14 years, the collective programs within Meigs, Mason and Gallia counties did not produce a single state champion of any sort or kind in any season of play, rather it be as a group or as an individual in either Ohio or West Virginia. Despite that rare twist in fortunes, the OVP area was still part of 62 league titles and had 71 all-state performers … not to mention 10 sectional champions, five regional champions and a pair of district champions. Instead of the traditional ‘OVP Top 5 Stories’ that have been produced over the past few years, the sports staff decided that the best way to honor the 2017-18 campaign was by simply looking back at all of the achievements that occurred in the tri-county area. The list itself covers any league, sectional, district or regional champion, as well as any special honor bestowed upon any athlete or coach at the league, district or state level. It will also go in order of season, meaning fall sports will go before winter sports —with the spring accolades coming at the end. We hope you enjoy a look back at the all of the major sports accomplishments to come from the OVP area during the 2017-18 school year. And remember, the quest for new accomplishments is roughly two months away. — Gallia Academy volleyball, Meigs golf, Eastern girls cross country and Southern golf all won league championships in their respective leagues. Both the Blue Angels and Marauders have gone unbeaten in league play over the last two years while also capturing at least a share of three straight conference titles. The Lady Eagles won their seventh consecutive TVC Hocking championship in cross country. — Gallia Academy freshman Sarah Watts was the individual champion in the girls Ohio Valley Conference cross country meet, while Eastern junior Ally Durst won the girls TVC Hocking Division individual title in cross country. — Meigs senior Levi Chapman was the individual medalist in TVC Ohio Division golf, while Southern junior Jensen Anderson won individual medalist honors in TVC Hocking Division golf. — Point Pleasant football qualified for the West Virginia state playoffs for a 10th consecutive postseason, as well as winning at least one playoff game for a fifth straight year. Both are school records. — Point Pleasant volleyball posted a 20-4 overall record, its first 20-win campaign in program history. — Gallia Academy football defeated Ironton at Memorial Field for the first time since 1984. The Blue Devils also swept the Fighting Tigers in both basketball and baseball this past year. — Four coaches came away with coach of the year honors in their respective leagues. Wahama’s Dave Barr was a co-coach of the year in TVC Hocking football, Tom Cremeans of Meigs was the COY in TVC Ohio golf, Southern’s Jeff Caldwell was the TVC Hocking golf COY, and Janice Rosier was the OVC volleyball COY. — Gallia Academy volleyball and Eastern volleyball were the lone sectional champions within the area. — The Eastern girls cross country team captured its seventh straight Division III district championship in cross country. — Ashton Webb and Janice Rosier, both of Gallia Academy, were respectively named the offensive player of the year and the coach of the year in Division II of the southeast district. — Six ladies were named all-state in volleyball. Ashton Webb of Gallia Academy was a third team selection in Ohio, while Point Pleasant had a pair of special honorable mention choices in Brenna Dotson and Gracie Cottrill. Point’s Lanea Cochran, Wahama’s Madison VanMeter, and Hannan’s Jessica Dalton were also honorable mention choices. — Alex Carlisle of Point Pleasant was a second team all-state selection in boys soccer, while Point’s Teagan Hay was chosen to the honorable mention list in girls soccer. — Mason County landed 11 all-state selections in football, with Point Pleasant leading the way with seven picks. Cason Payne was a first team honoree, while Justin Brumfield, Alex Gibbs, Tucker Mayes and Josh Wamsley garnering second team honors. Alec Smith and Eddie Mayes were also special honorable mention and honorable mention, respectively, in Class AA. Wahama had two special honorable mention choices in Christopher Hesson and Christian Thomas, while Colton Arrington and Johnnie Board were Class A honorable mention selections. — Ohio came away with 10 all-state selections in football, all of whom ended up being honorable mention choices. Southern had three picks in Riley Roush, Dylan Smith and Andrew Evans, while Gallia Academy — Justin McClelland and Jacob Campbell — and Meigs — Lane Cullums and Zach Bartrum — each had two selections. — The Marshall Thundering Herd went 8-5 overall and won their fifth consecutive bowl appearance with a 31-28 victory over Colorade State in the Gildan New Mexico Bowl. — The Ohio Bobcats went 9-4 overall and claimed a 41-6 triumph over Alabama-Birmingham in the Bahamas Bowl, ending a three-game losing skid in bowl appearances. — Gallia Academy wrestling was the only program to come away with a league championship during the winter months. It was the third consecutive season in which the Blue Devils came away with the OVC crown. — Gallia Academy wrestling was also responsible for eight of the nine individual weight class champions in league competitions. Caleb Greenlee, Kyle Greenlee, Jason Stroud, Justin Day, Boo Pullins, Kenton Ramsey, Bronson Carter and Logan Griffith captured OVC titles, while Jacob Edwards of River Valley also won both a TVC Ohio and sectional championship individually. — Two basketball teams won sectional titles while advancing to district play. 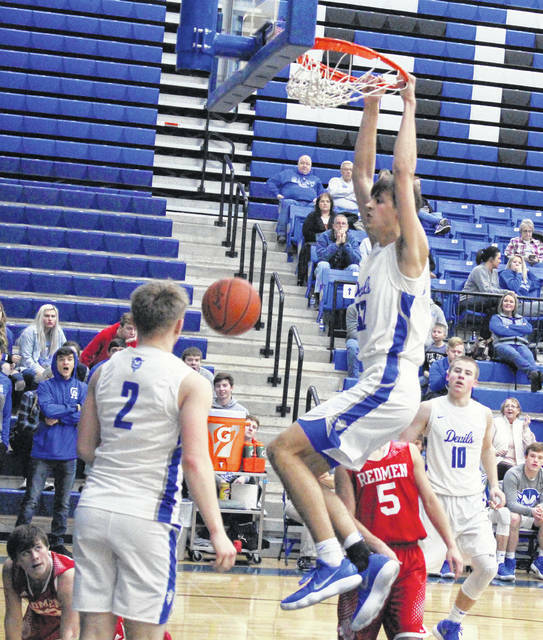 The Gallia Academy boys put together their first 20-win season in 15 years and appeared at the Convo for the first time in a decade, while the Eastern girls made their 13 consecutive appearance at the district level. — Gallia Academy boys basketball coach Gary Harrison was named the Division II Southeast District co-coach of the year. — Besides producing a second straight team championship at the Class AA-A regionals, Point Pleasant also had five grapplers win individual weight class crowns. The Big Blacks received regional titles from Christopher Smith, George Smith, Logan Southall, Mitchell Freeman and Jacob Muncy. — Five boys from Ohio received all-state honors in basketball. Gallia Academy’s Zach Loveday was a special mention selection in Division II, while Southern’s Weston Thorla, Weston Baer of Meigs, South Gallia’s Braxton Hardy, and Eastern’s Isaiah Fish all came away with honorable mention accolades. — Point Pleasant’s Kade Oliver, Wahama’s Noah Litchfield and Hannan’s Malachi Cade all received honorable mention selections to the all-state boys basketball teams in West Virginia. Cade was the only player in the OVP area to surpass the 1,000-point career plateau last winter. — Four girls from Ohio came away with all-state accolades, all of which were honorable mention selections. Eastern had two picks in Elizabeth Collins and Madison Williams, while Kassidy Betzing of Meigs and Alex Barnes of Gallia Academy were the other area choices. — Wahama sophomore Hannah Rose was the only girl in Mason County to be named to the all-state basketball teams. Rose was chosen to the honorable mention list in Class A. — Point Pleasant landed a trio of wrestlers on the podium as Christopher Smith, George Smith and Mitchell Freeman each came away with all-state accolades. — Eastern was responsible for three of the four league championships, which included outright TVC Hocking titles in both baseball and softball. The Lady Eagles track and field squad also won the TVC Hocking crown for a ninth consecutive year. Gallia Academy softball joined Coal Grove in sharing the OVC title, a first for the Blue Angels. — There were four relay teams that came away with league championships in track and field, with the Lady Eagles claiming three of those in the 4x100m, 4x200m and 4x400m events at the TVC Hocking meet. The Gallia Academy girls also captured the 4x800m title in the OVC meet. — The Eastern duo of Jessica Cook and Noah Browning were the area’s only multi-event league champs. Cook and Browning won both the 400m dash and 800m run at the TVC Hocking meet. Katie Fick (100m hurdles), Ally Durst (1600m), Layna Catlett (discus) and Tyler Davis (discus) also won TVC hocking titles for EHS. — The Southern duo of Sydney Roush (3200m) and Trey McNickle (long jump) won TVC Hocking titles in track and field, as did South Gallia’s Kyle Northup (high jump) and Wahama’s MacKenzie Barr (pole vault). — Meigs accounted for three of the four TVC Ohio championships in track and field, with titles going to Kassidy Betzing (long jump), Matthew Jackson (discus) and Riley Ogdin (shot put). Madison Tabor of River Valley was also the girls shot put champion in the TVC Ohio. — There were seven separate special honor winners in the TVC Ohio and TVC Hocking, with Eastern claiming five of those awards. Austin Coleman and Ethen Richmond were the offensive and defensive POYs in TVC Hocking baseball, while Eagles skipper Brian Bowen was named the coach of the year. Sidney Cook was the offensive POY in TVC Hocking softball, while Eastern’s Bryan Durst was the TVC Hocking coach of the year. Wahama’s Hannah Rose was a co-defensive POY in TVC Hocking softball, while Zach Helton of Meigs was named the offensive POY in the TVC Ohio. — Eastern baseball and softball, Gallia Academy baseball and softball, and Southern softball all won sectional titles in their respective divisions. Eastern baseball was the only program of the group to win a district championship. — Only two players were chosen to the All-Ohio teams this spring. Gallia Academy’s Josh Faro was a second team choice in Division II baseball, while Eastern’s Sidney Cook was a D-4 honorable mention selection. — Mason County had seven girls chosen to the all-state softball teams in West Virginia. Leah Cochran (second team), Kelsie Byus (special honorable mention), Tanner King (honorable mention) and Peyton Jordan (honorable mention) were selected to the Class AA squad on behalf of Point Pleasant, while Wahama landed Hannah Rose (first team), Emily VanMatre (special honorable mention) and Emma Gibbs (honorable mention) on the Class A team. —Mason County came away with eight selections on the all-state baseball teams in West Virginia. Tucker Mayes (special honorable mention), Miles Williams (special honorable mention) and Carter Smith (honorable mention) represented Point Pleasant in Class AA, while Wahama landed Dalton Kearns (second team), Tanner Smith (special honorable mention) and David Hendrick (honorable mention) on the Class A lists. Hannan also had Dalton Coleman (honorable mention) and Kevin Morehart (honorable mention) make the Class A squad. — Kassidy Betzing earned her third consecutive All-Ohio selection in the Division II long jump at the OHSAA track and field championships on behalf of Meigs. — The Point Pleasant duo of Sami Saunders and Luke Wilson earned multiple all-state accolades at the WVSSAC track and field championships. Saunders finished in the top-six of the long jump, high jump and pole vault in Class AA girls, while Wilson was a top-six placer in both the 1600m and 3200m runs of the Class AA boys. — Point Pleasant also received top-six efforts at the Class AA track and field meet from the boys 4x100m relay, Steven Trent (pole vault), Eddie Mayes (shot put) and Jesse Gleason (discus). — Kaleigh Stewart placed sixth in the Class A long jump, allowing Wahama to score a point at the girls meet for the first time in four years. Brodee Howard was fifth in the 110m hurdles and extended the White Falcons’ scoring streak at state to seven straight years. 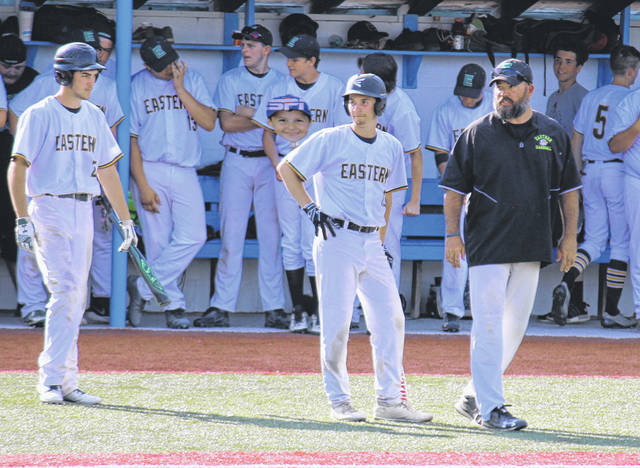 — Eastern baseball coach Brian Bowen was named the Southeast District coach of the year in Division IV. Austin Coleman was the D-4 POY in the Southeast District as well.